In the marketplace, you will find that there is a wide variety of people who are fulfilling the same role; however, at the end of the day, not everyone is capable of the same outcome. At least, not now, in their current point of training. In a skill-centric program, Organizations can identify traits and aspects of successful members of their current competencies and roles, and address the precise capabilities that need to be established to excel within those positions. The same organizations can weigh deficiencies exhibited by members in those roles, in order to create a more efficient workplace. Once these needs are identified, then, training can be developed that specifically suits the needs of the positions within a particular organization. What do we mean when we say skill? Skill is a fairly loose term within the Learning and Development community. A skill is defined according to Merriam-Webster as, “The ability to do something that comes from training, experience, or practice.” Our goal is not just to implement training for the sake of following an industrywide standard. Instead, the ultimate goal is to provide system users with the capability to obtain real-life practical and applicable knowledge that will not only aid in their immediate development: helping themselves and their organizations. But also to provide a repeatable, efficient, and amicable process, to be used across the entirety of an organization. What is a skill-centric design? A skill-centric design allows for a hierarchal overview of the entire learning process, with the end goal of creating learning objects that are not only practical but completely vital to members within the organization. 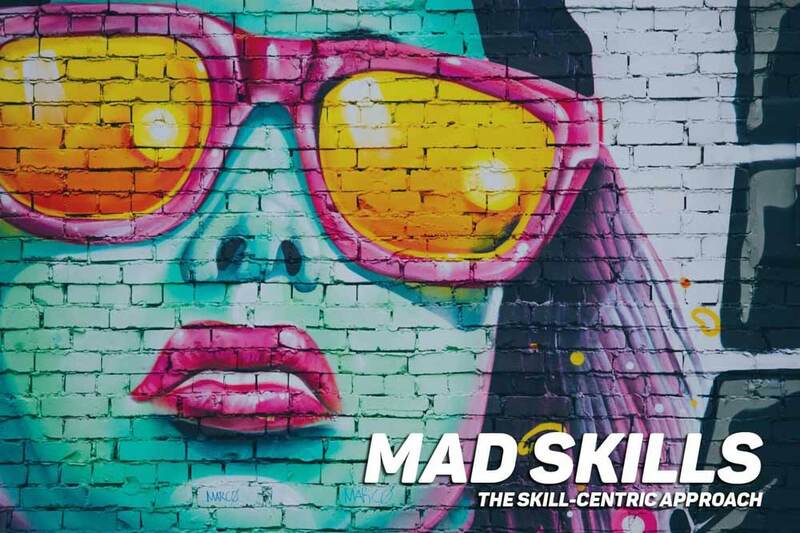 Skill-centric design embeds the core competencies of an organization as the immediate end goal for users within the system, then allows granular control as to who obtains these skills and when. The process of formulating learnings primarily for the development of skills can address positional shortcomings and extend the reach of organizational learnings. How do organizations benefit from utilizing skills? By coordinating the users that receive skill-level training, organizations as a whole can be much more certain about the capabilities of their employees. This can create an environment in which skills are provided as needed to individuals within operations. As well as allow for the ability to develop reports to identify skill deficiencies and gaps of members of the catered workforce in order to further progress learners. A skill oriented firm can address work areas progressively and are often not victims to a reactive mentality the influences users away from their core responsibilities at inappropriate times. Organizations should take charge of their required skills, and task their Human Resource departments with performing the exercise of establishing current and future needs, obtaining the insights of leadership team members as to what exactly they need, and possibly consulting with a third party operation to determine effective areas which could become a boon to growth. With this inflow of skill information, organizations are awarded the ability to identify different roles and their functions, what needs to be done to make them better, and perhaps procedural components that are lacking within the current state of the organization. Human Resource professionals can now take this information and develop a roadmap for employees, and building actionable development plans with skill focus as the core offering. Skills are an essential component of the learning and development world. By utilizing a skill-centric design, organizations can fully recognize the potential of their individuals, prepare said individuals for more advanced positions, as well as lessen the impact of training requirements on new hires. When searching for an LMS, be sure to take into account the manner of which it is organized, as a skill-centric design may be just what your organization needs to establish a more effective learning program. As always, thank you for joining us here at the Gyrus Blog, be sure to subscribe at the top right-hand corner of this page (Bottom if you are viewing this via a mobile platform), in order to get this fresh content distributed directly to your email inbox as it is posted. As well as follow us on social media for new content, product news, and interaction directly from Gyrus.